Darling one level home with great features. Covered entry to open plan with no carpet. Eat in kitchen open to great room with cathedral ceiling. Workable kitchen with refrigerator included. Split bedroom plan with walk in closets. Outside a covered patio, privacy fence and big storage building. Nice landscaping, security system. ©2019 Triad MLS, Inc. of North Carolina All rights reserved. Information deemed to be reliable but not guaranteed. 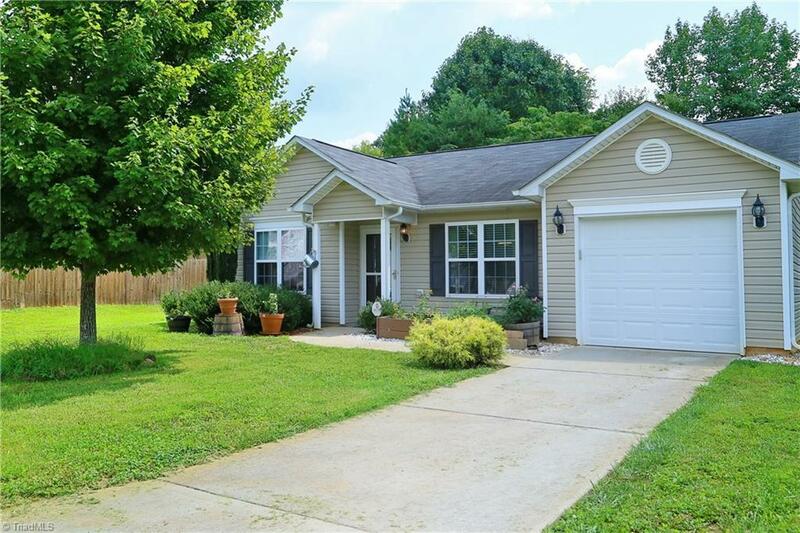 The data relating to real estate for sale on this website comes in part from the Internet Data Exchange (IDX) Program of the Triad MLS. Real estate listings held by brokerage firms other than Wilkinson Triad Realty are marked with the IDX logo and detailed information about them includes the name of the listing brokers. Listing broker has attempted to offer accurate data, but buyers are advised to confirm all items. Only residential listings are displayed on this site. The information being provided is for consumers\' personal, non-commercial use and may not be used for any purpose other than to identify perspective properties consumers may be interested in. This site will be monitored for \'scraping\' and any use of search facilities of data on the site other than by potential buyers/sellers is prohibited. Information last updated on 2019-04-25.